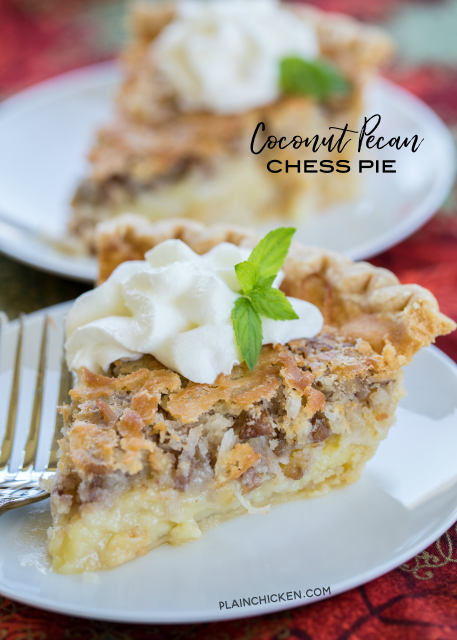 This Coconut Pecan Chess Pie deserves a spot on your holiday table. It is SO good!!! 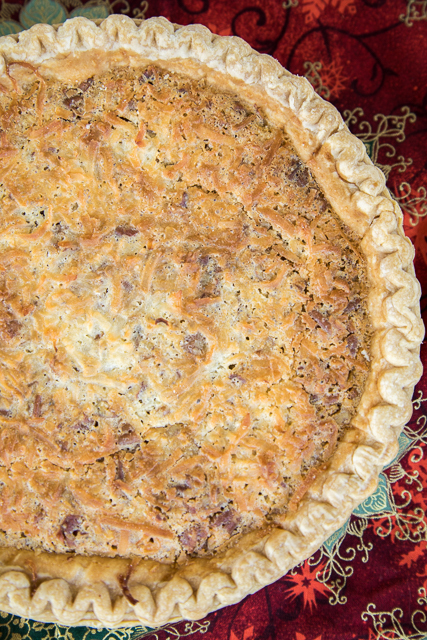 I love a good chess pie and this version with coconut and pecans is to-die-for delicious! 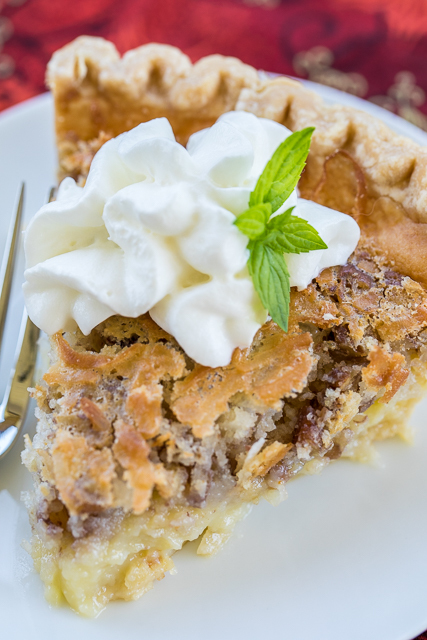 This pie combines two of my favorites into one - pecans and coconut. Not super sweet, just super delicious. This was so easy to make and can be made a few days ahead of time and refrigerated until ready to serve. It actually tastes better after it has been in the refrigerator overnight. As I said earlier, this pie is to-die-for! It is a must for your holiday meal. Trust me! 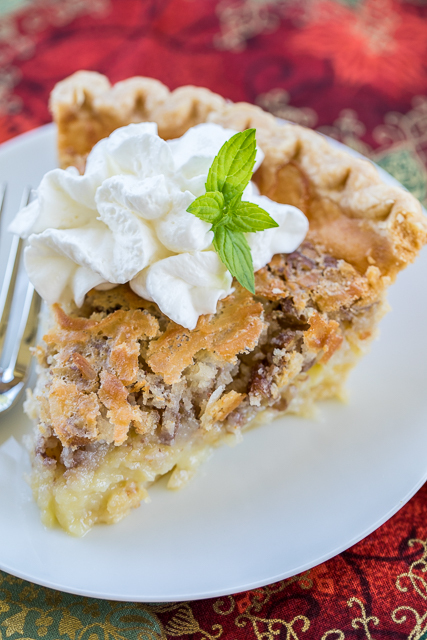 All you need is a dollop of fresh whipped cream and you are set! Whisk together eggs, sugar, buttermilk, melted butter, cornmeal and coconut flavoring. Stir in coconut and pecans. 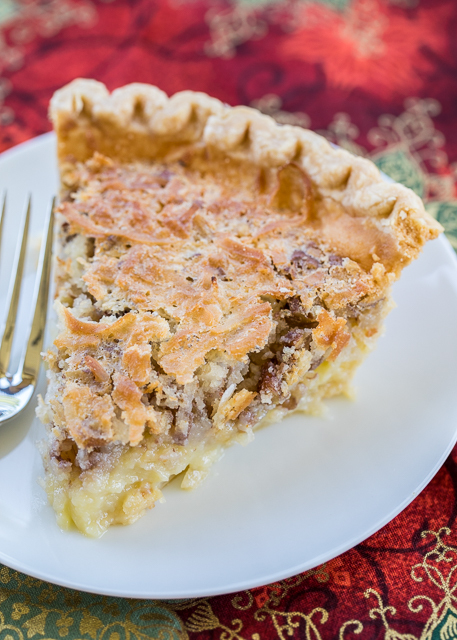 Pour into pie crust. Bake for 10 minutes. Reduce oven temperature to 350ºF and bake an additional 30 minutes. Let cool on wire rack. Looks fabu Steph! Does it matter if I use either yellow or white plain cornmeal...and would you recommend substituting a cornmeal mix? Thanks for all of your dynamite recipes, and I wish you and your family a Merry Christmas and Happy New Year!!! Either white or yellow is fine. I haven't tried this with cornmeal mix. It has other stuff in it, so it might change the recipes slightly. do you mind if I use this recipe to ask question about your divine peanut brittle? Do you have a tip for cleaning the Pyrex bowl after? I soak it in hot water - after a few minutes the hard sugar will slide off. I'm making a batch today! boy this looks good. I was planning on making coconut cream tarts for Christmas but now I'm leaning in this direction. I have 12 small pieshells (tarts) that are frozen and undooked. I need to use them. Do you think this would make enough for the tarts. Any suggestions on how long to cook them? It's hard to say without knowing how big the pie shells are. I would start with about 15 minutes baking time and see if they are cooked. This looks amazing! Question: you mix everything together, but it looks layered (nuts on top). Does this happen during the baking, somehow? Just mix everything together. It isn't layered. Can you use vanilla extract instead of coconut? My pie tasted great, but didn't set very firm. Any suggestions as to what might have gone wrong? Maybe bake it a few minutes longer. Cover with foil if getting too brown. You can also try refrigerating overnight before slicing.